Wood decking, step 4 (of 7), on how to build a 10' x 10' deck, will show how to lay decking in a way that is extremely easy and looks great! At the deck laying stage, your deck frame should be built, square, firmly attached to the house, and supported by vertical posts and concrete footings. 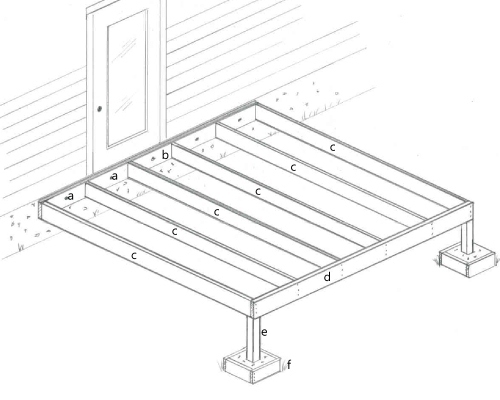 Laying decking is simple as long as you follow a few basic guidelines. One thing you don't want to do is to start laying your decking beginning from the part of the deck attached to your house outward! You should do the exact opposite. Start at the front of the deck and work your way back to the house. Always use #2 pressure treated pine for the deck framing and for posts that support the deck. You can also use this same material for decking and handrail. Western red cedar or redwood also work well for wood decking and handrail, but require a little more maintenance. There are also other composite materials used for deck building that are available. Search online for the best decking material for your project. The following instructions assume that the actual width of your decking is 5 1/2 inches wide (2x6). From the left front corner of the deck framing, measure back towards the house and make a mark at 4". Repeat this procedure on the right front corner of the deck frame. Stretch a chalk line from the first point to the second point. Pull the line tight and pop it. 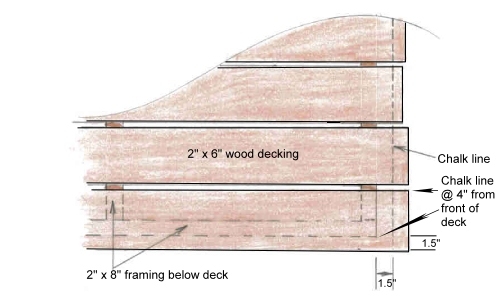 You should now have a straight line extending the complete width of the deck, and 4 inches from the front of the deck. This will be the position of the first deck board. Pick out the straightest 10' deck board from the lumber package and, starting at the front of the deck, center it between each side and line it up along the 4" chalk line. 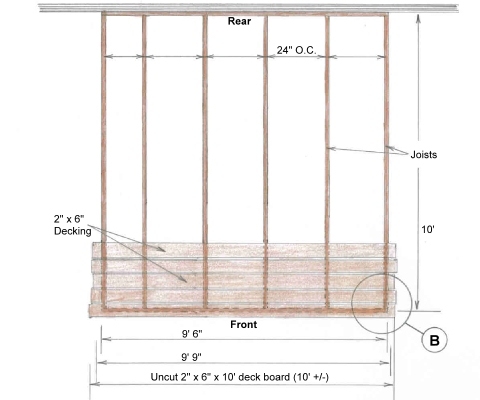 Once installed, the first board should overhang the front of the deck framing by approximately 1.5" and about 3" on each side. Screw or nail the first deck board in place. Don't worry about the 3" overhang on each side. That will be trimmed off later. When you get about two deck boards from finishing the decking, it is time to trim off the extra overhang on the deck boards. To do this, make a mark 1.5" from the framing on the last 2x6 you laid, and another mark 1.5" from the framing on the first 2x6 that was laid (see diagram B). Stretch a chalk line between the two marks and pop a line across the top of your decking. The idea is to leave 1.5" hanging over the edge of the deck framing. Once you have verified that your chalk line is correct, cut along the line with a circular saw to trim off the excess wood. Remember, "measure it twice, and cut it once." You can't add the wood back on after you cut it off! Perform the same steps on the other side of the deck. Once you have cut the excess off of both sides of the deck. Cut the remaining deck boards to size and nail/screw them in place. The very last board is perhaps the most challenging, because you will probably have to rip it to the width you need.